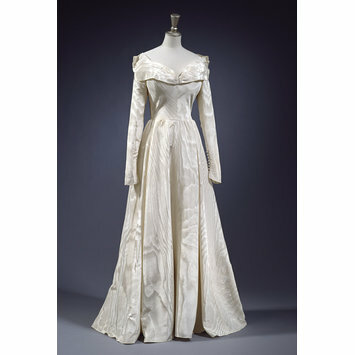 Wedding dress in cream silk moiré with a full length, full skirt, closely fitted bodice and long tight sleeves. The neckline cut wide and low, with a knife-pleated bertha collar. Row of closely spaced covered buttons at wrists and back zipper. 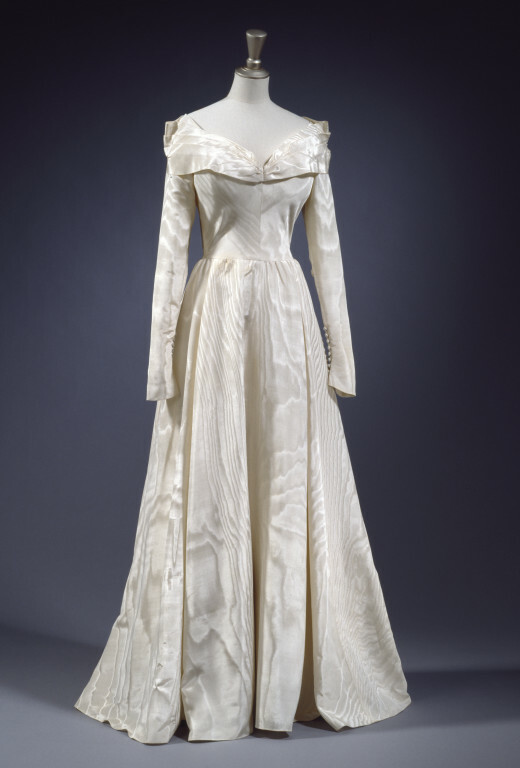 Two stiffened synthetic silk waist-petticoats, the top one in silk with a deep moiré flounce, the bottom a crinoline slip interlined with stiffening to support the skirt. Wedding veil of fine silk net attached to a cream satin band with elastic band. Matching cream silk moiré sandals, made by Rayne, with wrap-over effect peep-toe and button, low-ish heel and ankle straps. This dress was worn by the fashion model Patricia Aileen Cunningham to marry the British couturier Charles Creed at the Assumption Convent, Kensington Square, on 1 September 1948. Feeling it would be inappropriate if he were to design her dress, Creed recommended his fellow British couturier, Edward Molyneux, to his wife.